Jose Mourinho believes his side can look forward to some emphatic victories if they replicate the level of performance they showed at Leicester. United conceded a last-gasp equaliser and had to settle for a 2-2 draw in Saturday's Premier League clash, but Mourinho would be more than happy with a similar display when his side host Burnley on Boxing Day. "In one match happened what we call the unpredictable of football - and it happened to us. But I don't think it happens many times when you play so well." Mourinho also reaffirmed his belief that United have been disadvantaged by the fixture scheduling this Christmas. 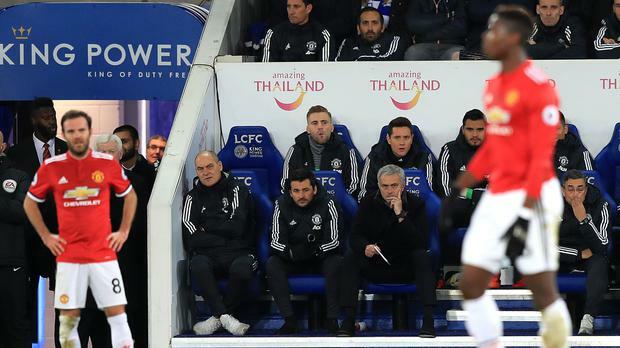 The Leicester match was the first of four top-flight games in 10 days for his side and Mourinho has already stated that he feels his side have been " punished" by the festive fixture list. He said: " I'm not just saying about the privileged ones with six days to recover and to enjoy and to prepare for the next one, but also the ones with a little bit more (time) than us, for example the ones that play after tomorrow - that extra day means a lot. "It means probably they are not working today, it means they can be back to work tomorrow and prepare for the next day. The problem that I see here is the difference between some teams. "B ut what I call the December injuries in English football are arriving. Some players are leaving the pitch after 15-20 minutes, some others don't resist for the 90. "Of course it depends on many factors, but we open the door for what I call the December injuries." " The positive of it is for me the Boxing Day match," he sad. "I do it with pleasure, I do it thinking that families are coming, people love it, even around the world. Families at home they love football, so I feel we are giving something that people love. The positive side of it is that good feeling." Mourinho admitted this Christmas had been a tough time for him personally as it was the first one since the death of his father, former Portugal goalkeeper Jose Manuel Mourinho Felix, in June. "It's the first Christmas without my father and I think that's the most difficult one," he said.